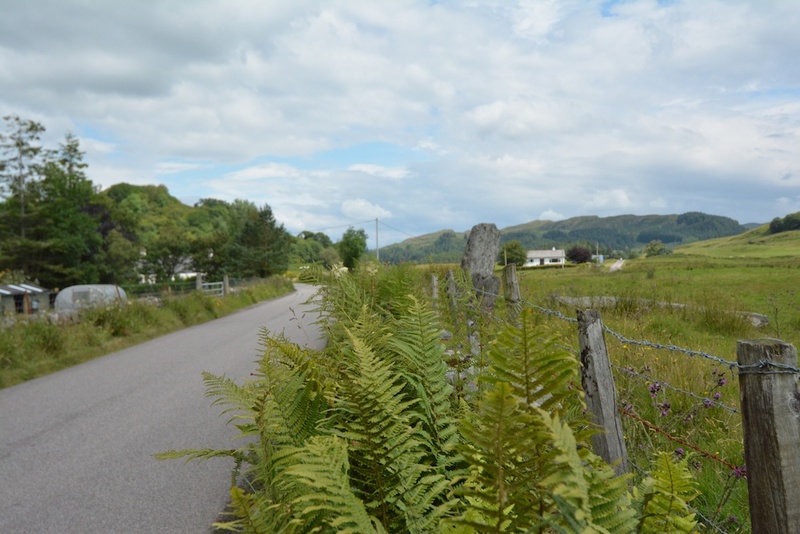 From the village of Kilmichael Glassary in Argyll, a minor road winds its way north-east then almost directly north alongside the Clachandubh Burn. 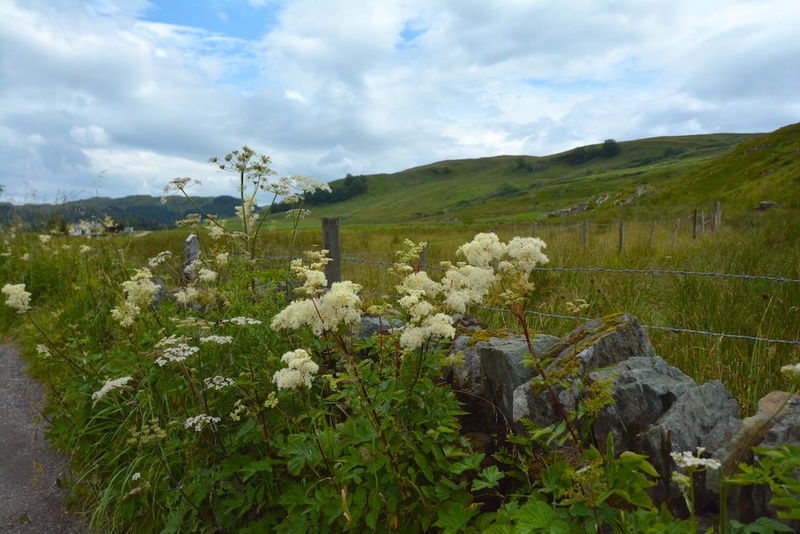 The road has three gates, and after Loch Leathan, which has an interesting little crannog, it looks more like a farm track, but if you persist it brings you out at the south end of Loch Ederline and joins up with a B-road. This is a landscape peppered with ancient sites: one glance at an OS map reveals a host of cairns, cup-marked rocks and cists (small burial chambers) scattered among the low hills and farm fields. 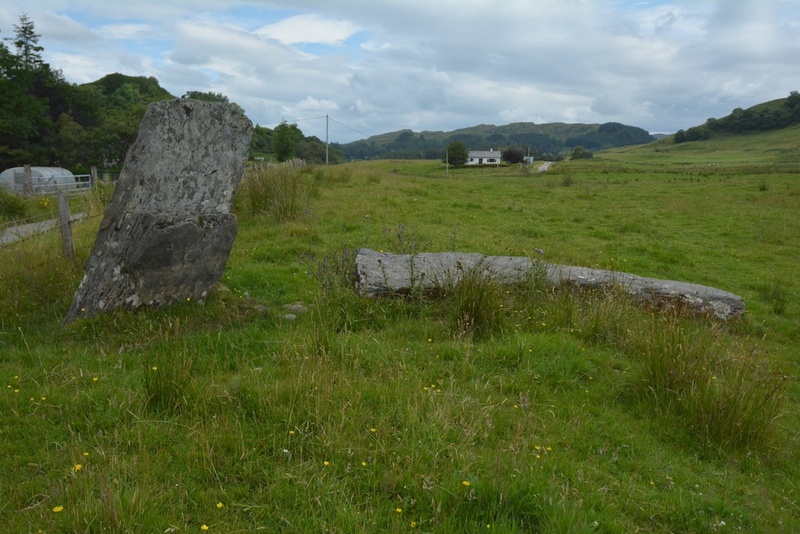 Not far away are the better-known stone circles, alignments and burial cairns of Kilmartin Glen. It’s hard to put a foot down without treading on ancient history. 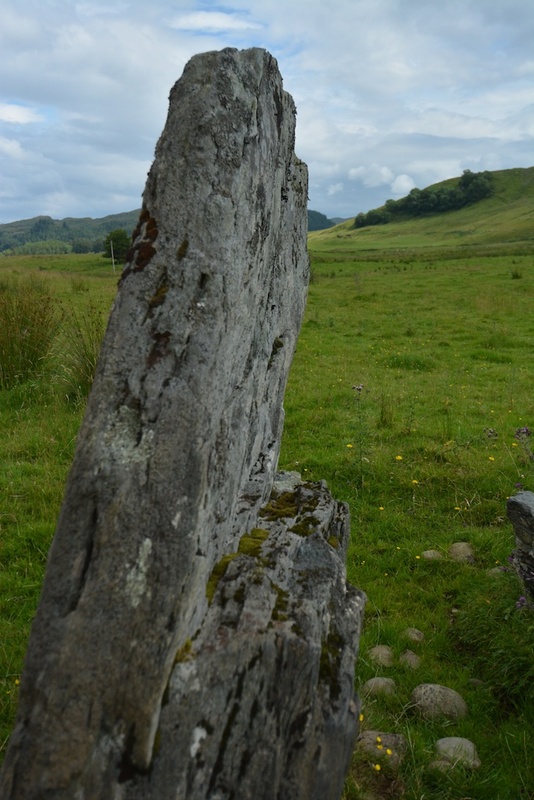 Shortly after turning onto the B-road we noticed a standing stone right by the roadside, on the other side of the wall. 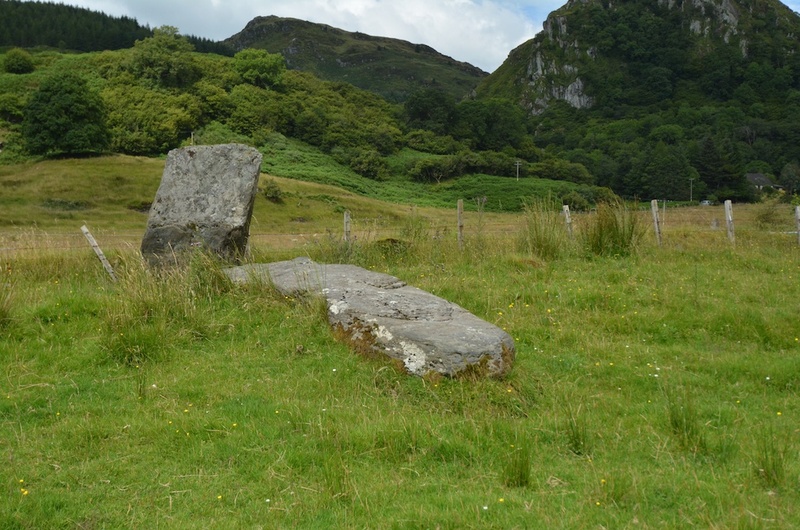 We scrambled over the fence, pushing through a cloud of meadowsweet and nettles, and were astonished to find that the stone was much bigger than it first appeared. It stands to a height of about 5’6″, but alongside it is a much longer fragment, about 11 feet in length, which (from the shape of it, and the scars on the stump) must have broken off at some stage in the past. A monolith of 16 feet in height would have been a noticeable landmark, even in a landscape of many standing stones. On checking websites when we got back, I read that the stone was blown over and smashed in the ‘Tay Bridge Gale’ of 1879 – so called because it wrecked the rail bridge over the River Tay and caused considerable loss of life. From this, I would imagine that the entire stone blew over, and the base of it was perhaps put back into place by a local farmer. I find it hard to imagine a standing stone being felled by a gale. The Tay Bridge was exposed and vulnerable, but monoliths have been rooted in solid ground for millennia. It must have been a truly horrific storm. A number of rounded cobble stones were showing through the grass, reminding me of the cobbles that cover the sites of Dunchraigaig and Temple Wood in Kilmartin. I wondered if these had perhaps been used to pack the stone when it was first buried, and had been uprooted when it fell. But that is just my speculation – they could be from something else entirely. 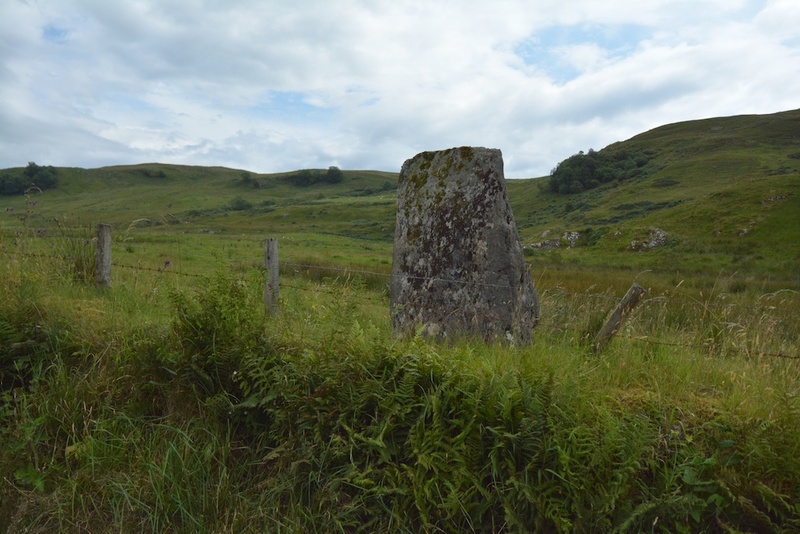 On the map, the stone itself is called Creagantairbh Beag, which is also the name of the farm close by. I don’t know the full Gaelic translation*, although ‘creagan’ appears to mean ‘alder‘ and I know that ‘beag‘ is ‘small’. If anyone can help, I’d be interested to know! *Footnote: My thanks to Margaret Donnelly (in the comments below) for offering the Gaelic translation of Creagantairbh: ‘rocks or precipices of a bull’. Very interesting! Hi, Jo. Re ‘Creagantairbh’. – it’s Gaelic for ‘Rocks / precipices of a bull’. Tarbh = bull (Latin – Taurus). Tairbh is the genitive case ‘of a bull’. Alder= fearna and represents the letter ‘f’ in the Gaelic alphabet. How very interesting! Precipices of a bull – there has got to be a story there. Thank you very much, Margaret! The cobbles may be packing stones as you suggest, or they may be cairn material. I don’t think this stone has been excavated. He may of course have visited it prior to the gale of 1879 and not known that it had fallen. That’s interesting to know – thank you very much for the link. If it was leaning so much, I doubt even more if it was toppled by a gale – more likely human force! I was interested to read about the nearby cross-incised stone. Shall have to look for that! Thanks again for your help. Ahh, love the pics! As if the farm has grown up around it. Thank you. What a find, and what a mystery! I know – that’s why I love these old stones! Could be possible, Lyn! There must be lots that are not formally recognised or catalogued. That’s a whopper of a standing stone. I wonder if it could have been damaged by a lightning strike in the storm. That’s a great thought, Lorna! It sounds more plausible than being blown over. I like the idea of the stones being lightning conductors. Yes, this one would have been an impressive height when it was still intact. the r is long as Ta-ruv. Now the hamlet is known as Creaganterve. We have no idea where the name comes from, but Tairbh has its derivation from Taurus, the bull, so maybe something celestial. I haven’t visited at night, but I think the constellation Taurus is in the north west in winter, so may be visible over the rock. Either that or a clumsy bull took the wrong turn! Hi John, thank you for clarifying that! Some interesting possibilities. I’d love to explore the Taurus theory! Sounds as if you’ll also have some great opportunities for star-gazing – what a lovely place for a house, and I wish you all the best with the project.